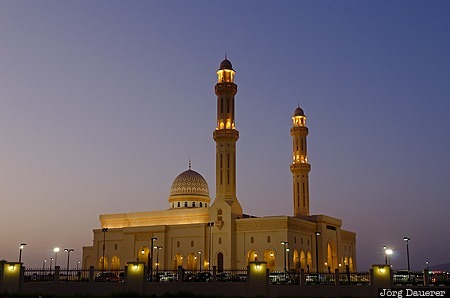 The flood-lit Sultan Qaboos Mosque with its two minarets and its cupola in Bani Bu Ali at the blue hour after sunset. Bani Bu Ali is in Ash Sharqiyah in the east of the Sultanate of Oman. This photo was taken in the evening of a sunny day in March of 2012. This photo was taken with a digital camera.